Munich has a lot more to offer when it comes to interpretations of traditional Bavarian food. You don’t necessarily need to eat the knuckles of a pig or a whole chicken to get a sense of Bavarian flavors. Oktoberfest, or Wiesen as the locals call it, is just a few days away. In Munich it almost counts as its own season and so the year is divided by five instead of four. The transition from plums to apples and from fresh tomato salads to slow cooked stews is eclipsed in Munich because of it. The city is simply too busy anticipating Oktoberfest to mourn the end of summer. Internationally Oktoberfest is known as a beer festival, or more accurately as the beer festival. However, there is much more to this sixteen day celebration than beer, Lederhosen and Dirndl. Perhaps the six million people who attend Oktoberfest each year forget to mention that there are rides, games and food as well. Lots of food, actually. The city of Munich reports that in 2010 visitors ate 40, 850 kg of fish, over half a million rotisserie chickens and 119, 302 pairs of pork sausages! Oktoberfest is just as much an eating festival as it is a beer festival. However, Munich has a lot more to offer when it comes to interpretations of traditional Bavarian food. You don’t necessarily need to eat the knuckles of a pig or a whole chicken to get a sense of Bavarian flavors. Fei Scho is a good gateway to Bavaria. It introduces you to some of the flavors of the region without the prodigious pile of bones on your plate. 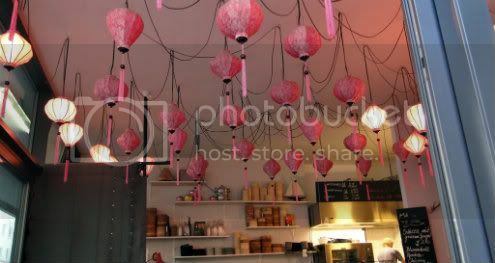 Don’t let the name or the pink paper lanterns from Vietnam mislead you; this restaurant takes some of its inspiration from Bavarian classics. The name itself – Fei Scho – is even Bavarian dialect. “Fei scho” cannot really be translated as it does not even translate from Bavarian to German. It is dialect meaning something along the lines of “pretty damn”, for example pretty damn good. Here the classics might be served in steamed dumpling wrappers, but they are “pretty damn” tasty and have many of the same flavors that you will find in a nearby Bierkeller or Biergarten. Take for instance the dumplings filled with Schweinekrustbraten – a slow roasted pork dish that is as Bavarian as they come – with a dark beer sauce and sauerkraut made with apples and red cabbage (3 for 5.40 euro). Other dumplings for meat lovers include pork goulash with caramelized palm-sugar in a yeast dough as well as duck with spinach and sesame. The vegetarian options may be less Bavarian, but they are equally inspired and include dumplings with red beet, feta cheese and spinach. There are also daily specials that are in rhythm with the seasons and they can range from chicory, apricot and cauliflower dumplings to ones filled with chicken and mango. Fei Scho offers much more than dumplings – from pho to salads and from spring rolls to noodles – but each time I visit I eat too many dumplings to explore the rest of the menu. All of the dumplings are steamed and stacks of bamboo steamers participate in the restaurant’s décor. The dumplings also come with servings of rice, pickles and salads – from a salad of green cabbage, pineapple and peanuts to a carrot salad with a mayonnaise dressing – and four dipping sauces. Fei Scho even has daily dessert dumplings. A Steamed dumpling with melted chocolate and banana? I’ll take two please. By day Sasha works in art and by night she beats up her pans by baking too much, or over-packs her suitcase with edible souvenirs. She takes breakfast very seriously and rarely turns down the opportunity to add maple syrup to a recipe. She is from Canada, but has lived in France, Denmark and Sweden. She is currently based in Munich. Sasha writes the food and inspiration blog Paper Doll Parade.